It’s been a long and rewarding journey for Ari Ariaratnam, from South Asia, to being celebrated at the Mayors’ Dinner for her work serving immigrant and visible minority women. Ari was born in a small town near Jaffna, Sri Lanka. The fifth of six children, Ari remembers a busy and loving family life. She received a lot of guidance from her sister, four brothers and her mom, who was always calm and angelic. But it was her dad who was perhaps the most influential, instilling in her the values of service and hard work. Principal of a local school, he enrolled her in his school at a time when most families didn’t educate their daughters. He used Ari as an example and convinced many families to register their daughters at his school. Always a studious pupil, Ari was a pioneer and served as a role model for other girls in the village. Later on, Ari went to a boarding school to finish her high school and then to India at age 15 to study at the University of Madras. She studied History, and she also took on leadership roles in the school’s Student Christian movement and the Senate. After graduating with a Bachelor of Arts degree, Ari returned to Sri Lanka in 1957. At age 19, she took on a teaching job at a high school, where some of the students were older than she was. It was a busy and happy time for the next eight years, teaching, coaching sports and leading the debating society. In the summer of 1965, Ari married Ariam Ariaratnam, who was home for a visit. He had studied abroad in England and the USA, and was on the engineering faculty at the University of Waterloo. The marriage was arranged by their parents and they left Sri Lanka soon after to start a new life together in Canada. It was a period of fast and huge change for Ari. Though she missed her family and friends back home, she warmly recalls how she was welcomed into the community. “The wives of the other professors were very kind, and so were members of Parkminster United Church, especially the minister’s wife who took me under her wings” she says. She soon became active in the community, managing an adult program at the KW YWCA. Her first son was born in 1966, joined in due course by three more boys. Busy with family life over the next several years, Ari nonetheless stayed involved in serving the community. In the late 1970s and early 1980s, the profile of KW was becoming more diverse as people arrived in substantial numbers from Vietnam, Laos, Latin America and elsewhere. Very aware that most of the newcomers didn’t have some of the advantages that had made her integration easier - such as joining a spouse who was already established here, fluency in English - Ari wanted to help. A friend who was on the board at the KW Multicultural Centre asked her to volunteer. Soon she became a paid settlement worker and eventually the executive director. She hired some key staff such as Lorna van Mossel (later a citizenship judge and Mayors’ Dinner Guest of Honour in 1994) and Maria Alvarez, who would later head up Immigrant Services at the KW YMCA. The KWMC board decided to emphasize cultural programs over settlement work. So Ari left the organization at the end of 1985. But she wasn’t on the sidelines for long. The Waterloo Region Social Resources Council asked Ari to participate in a status of women group. There were a number of employment and training programs for women, but none specifically geared to the needs of immigrant and visible minority women. Life wasn’t easy for newcomer women. At that time, government funding for English as a second language was available only for the “head of the family” - usually the male. “Without the opportunity to learn to speak English, many immigrant women were often trapped at home or in survival jobs like worm picking,” she says. 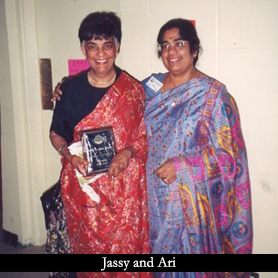 In 1986, Ari gathered a group of like-minded women, including her friend Jassy Narayan, and founded Focus For Ethnic Women (FEW), whose mission is to “Enhance the participation of immigrant and refugee women in Canadian society.” They received funding for a feasibility study to set up a culturally relevant training program. A six-month study followed. From that study grew Skills Unlimited, which would provide occupational training in sewing, English-language instruction and life-skills training for immigrant and refugee women. Ari served on the inaugural board of FEW. The board appreciated Ari’s vision and dedication, and hired her to be the organization’s first executive director. In the years since, Focus has helped thousands of women. It expanded its range of services through programs such as Investing in Women’s Futures, funded by the Ontario Women’s Directorate, to help women with their job search. Ari also successfully applied in 2002 for funding from the United Way of KW and Area for a Healthy Lifestyles Program to reach out to women in the community by organizing Friendship Groups in various community centres. She asked Jassy to take charge of this program and it has since expanded to several sites. Ari retired from Focus in 2003. In recognition of her years of commitment and service, the board established the Ari Ariaratnam Education and Training Fund to assist immigrant and visible minority women with training costs.She later returned to the organization for a few months as interim executive director to guide the organization through a transition period. There were many other activities as well, including serving on the boards of the Waterloo-Wellington Training and Adjustment Board and English at First. Ari was also appointed a member of the Refugee Status Advisory Committee and later as a member of the Immigration and Refugee Board of Canada. Though she has never sought recognition for her work, Ari has been recognized with such honours as Queen Elizabeth Golden and Diamond Jubilee medals, a Citizenship and Culture Volunteer Award and selection as one of the KW Oktoberfest Women of the Year. Jassy Narayan says she never expected a tribute such as being honoured as one of the Guests of Honour at this year’s Mayors’ Dinner. As she puts it, she’s just an ordinary woman who grew up in rural Guyana who did not have much opportunity for formal education as a child, only being able to go to school until grade 8. But her journey has taken her on a long path of service to others in the community. Though her family may have lacked material resources, there were strong social bonds, with a long tradition of women being involved in community life. Jassy had two strong role models: her mom, and an aunt who lived in the city. She calls her aunt a suffragette, who helped to start an organization to educate Indian children, raised money to buy textbooks for kids, and advocated for the education of girls. “Those values became a real foundation for me,” she says. Jassy arrived in Canada in October 1966, settling in Kitchener-Waterloo with her husband and their three young daughters. Her husband got his first Canadian job at Ontario Office Outfitters on Queen Street (where The Working Centre is now located). Busy raising the kids, Jassy got involved with the YWCA, volunteering with a community group for stay-at-home moms, and later served on the board. During these early years she met Lorna van Mossel, who became a friend and mentor. Through Lorna, Jassy assisted with the settlement of refugees from Vietnam, Laos and Latin America. Barbara was impressed with Jassy, and encouraged her to enrol in the early childhood education program at Conestoga College. She didn’t think she would be accepted, since she didn’t have a high school diploma. But Barbara persisted, and helped set up an interview for Jassy at the college. She was accepted, and attended classes part-time over the next three years to earn her diploma. That wasn’t the end of her educational journey. She then enrolled in the Master of Social Work program at WLU in 1984, focusing on community development. The theoretical education was very helpful, but it was the practical projects that really resonated. After graduating with her MSW in 1987, Jassy worked for Lutherwood in Cambridge, connecting with community groups including the Greenway Chaplin, Christopher Champlain and Southwood neighbourhoods. She says she learned a lot from those community members, and this gave her the experience she needed for her next role. It was around that time that Jassy’s marriage ended. She continued to keep busy volunteering, such as serving on the board of the KW YWCA along with her friend Ari Ariaratnam. Ari invited her to a meeting to discuss a plan to develop a training program for newcomer women who did not have formal education or work experience. That was the genesis of Focus for Ethnic Women. “I was a founding member, and served on the volunteer committee, but was not on the inaugural board,” she says. But her involvement wasn’t limited to helping start the organization. Jassy later sat on the board, served as president and also acting executive director for a time after Ari retired. In 1991, Jassy was hired as the first executive director of Better Beginnings, Better Futures-Guelph, serving the Willow neighbourhood in Guelph. The organization ran a wide range of programs and activities for children, their families and the community. Under her direction, the organization collaborated with service providers and community leaders, and recruited a culturally diverse staff. Jassy was impressed with the wisdom and generosity of neighbourhood leaders, whose acceptance of different cultural norms and values helped new families to integrate more readily. Jassy retired from Better Beginnings in 2002, but it really just meant a new phase in her career of serving and advocating for marginalized members of the community. She went on to serve as an active community member on the steering committee of the Waterloo Region Immigrant Employment Network and the Immigration Partnership. She’s also an assistant practicum professor in the WLU Faculty of Social Work, supervising MSW students doing their practicum placements. In addition to all that work in the community, Jassy enjoys spending time with her three daughters and her grandchildren. As she likes to remind them, it’s important to help others, to strive to make the community a better place for everyone.